producers, food manufacturers and retailers make and sell millions of innovative food products, such as drinks, cakes, biscuits, ready to eat and ready to cook food, sandwiches, wraps and fresh fruit and salads to consumers in the UK and around the world. Food Technologists are passionate about their industry and ensure all products are safe to eat, of consistent appearance, taste, and texture and take great pride in their work. There are many varied employment and career opportunities in the food science industry; within a laboratory based environment to ensure the safety and quality of food products, in development roles to improve existing products and launch new products, in factory based roles working with teams to develop good manufacturing practices and within the supply chain to develop good relationships with suppliers and customers. Food Technologists may be employed by a grower, in a large or small food manufacturer or by a retailer and there may be opportunity to travel extensively as part of their roles. 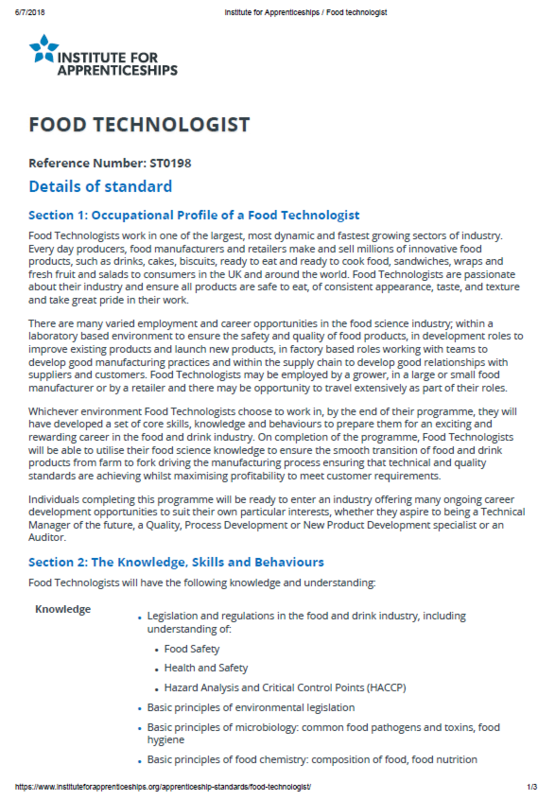 Whichever environment Food Technologists choose to work in, by the end of their programme, they will have developed a set of core skills, knowledge and behaviours to prepare them for an exciting and rewarding career in the food and drink industry. On completion of the programme, Food Technologists will be able to utilise their food science knowledge to ensure the smooth transition of food and drink products from farm to fork driving the manufacturing process ensuring that technical and quality standards are achieving whilst maximising profitability to meet customer requirements. Individuals completing this programme will be ready to enter an industry offering many ongoing career development opportunities to suit their own particular interests, whether they aspire to being a Technical Manager of the future, a Quality, Process Development or New Product Development specialist or an Auditor.